Many people shy away from using the Method feeder in winter, fearful that they will end up over feeding their swim, even though, its effectiveness is well documented. As anglers, I feel that we have become stigmatised, almost unequivocally convincing ourselves into becoming too negative in winter, especially regards to how much we feed. Personally, I’m not a great believer in sitting behind a single hi-viz hookbait, expecting it to draw the fish for me. There are of course times and places in the cold weather that this will work, but I reckon it is more of an exception than a rule. In winter, when it comes to carp, if you find one of them, you often find all of them. But, if you’re not lucky enough to draw a swim like this, you’ll need to pull the fish to you. And for me, this is where a tactic like the Method comes into its own. Also, as a match angler, I feel a lot more confident having my hookbait sat over a neat, small pile of free offerings. It is a simple case of effort verses reward for the fish. I feel they are more likely to move and feed on something worth having, than a single grain of corn or a hair-rigged sliver of bread punch. And the latter is something that I see a lot of match anglers doing all too often. Backing themselves into a corner by being too negative. Yes, less can be more, but so very often, less can be much less and you end up cutting your own throat – or catch rate – by feeding too little. Even in the depths of winter, I will always set up a Method rod. The key to the tactic in this instance is how you fish it and apply it to the swim. Of course, during the height of summer, I’d be casting every 90-seconds to two-minutes, looking to build an island of 3mm pellets in front of me. Now though the key to success is ‘winterising’ the approach. My go-to loosefeed here will be a 60/40 mixture of Dynamite 1mm Swim Stim Amino Original pellets and the new 2mm Dynamite Swim Stim Amino Original pellets. The reason for using the 1mms is two-fold. Firstly, they help create a very fine ‘carpet’ of loosefeed on the lake bed, perfect for holding fish with next to no chance of over feeding them. Due to their tiny size, they easily get lost under stones and other detritus, so they have plenty of time to breakdown, flooding the water with flavour, taste and attraction. The second reason I love these little pellets, is they are ideal for gap filling. This means that the pellets are much more tightly packed onto my Method feeder. This ensures the pellet payload will reach the lakebed intact every time. Something that is of paramount importance when targeting deep water venues especially. A tightly-controlled area of loosefeed is incredibly important in the winter months. The 2mm pellets are used as a holding bait, as is usual when fishing the Method. The only difference here is that I’m using a lot less of them per cast. To prepare the pellets is simplicity itself.The 1mm Swim Stims are doused in water and then soaked for around 30-seconds before all the water is poured off. The 2mms are left to soak for approximately 90-seconds; the two are then mixed 40:60, 2mms to 1mms. I am asked on occasion why not use groundbait instead of pellets as being much finer, it must surely be less filling for the fish. I will only use groundbait if there are a lot of f1s or skimmers in the water. 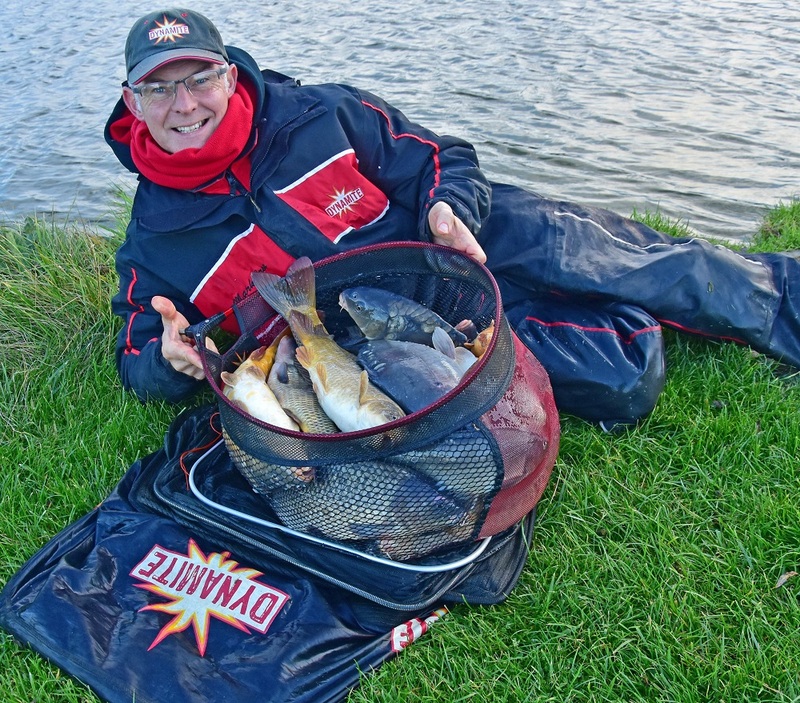 When it comes to out and out carp fishing – like today – my philosophy is to use pellets, pellets and more pellets! 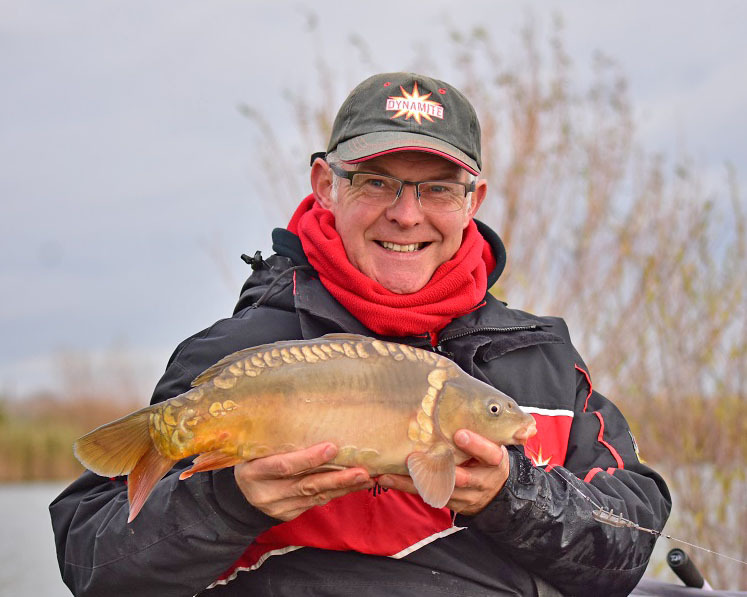 The use of the 1mms is almost like using a groundbait, only the pellets don’t produce a cloud in the water, plus, as groundbait is so much lighter than pellets, when the fish move in, their fins and tails can end up wafting the groundbait away. Pellets on the other hand will get wafted into suspension, but are more likely to sink just as quickly too, ensuring the tight baiting area that I am so keen on at this time of year. This is where I do swap over to hi-viz. In summer, I love to ‘match the hatch’ using a pellet on the hook. In the cold, clear waters of winter, I find a bright, highly-flavoured, slightly-soft hookbait is unbeatable. My first choice is one of Dynamites’ Slow Sinking Nuggets, either red or yellow. I do use the brown and white ones on occasion, but I much prefer my hookbait to standout over the natural-coloured pellet loosefeed. When they take a mouthful of bait, I want my hookbait to be one of the first things they take. To winterise these Slow Sinking Nuggets, I like to trim them slightly. Only because I think a smaller hookbait looks more natural over a smaller bed of feed and also it helps them to start to breakdown a little faster, so again I’m helping my bait choices flood the water with attraction. To boost this attraction level even further, I dip the Nugget hookbait into some neat Dynamite Baits’ Fish Gutz liquid for 10 to 15-seconds prior to loading the feeder and casting. Fish Gutz is an additive I have had a great deal of success with, particularly in the colder weather. It is packed with unique feeding triggers, flavours and tastes. Regards my set-up, I like to use a 1.5oz quiver tip. Although this is rather light for Method work, the fish tend to fight quite ‘doggedly’ and so the lighter tip helps to cushion this. My mainline is 6lb Invisitech to a 0.19mm Drennan Supplex hooklink. The latter appears very heavy for winter fishing, but I want it more for its stiffness rather than its breaking strain. The carp find it harder to eject a stiffer hooklink. To amplify this anti-eject quality, I tie the hooklink onto the small 30g Method feeder using a loop and a small rig ring. This allows the hooklink a lot of movement, again helping to ‘nail’ the fish every time! To complete the rig, my hook choice is a size 14 QM1, tied with a hair rig. When it comes to the fishing, there is always a depth that the fish like to sit at in winter. Generally, I like to start the session at around two-thirds depth. In this case, with the deepest part being 14-feet, I’ll be looking to fish into nine-feet or so. Once I find where they are, it is then a cast of casting and waiting. Normally I’ll be looking to cast twice an hour unless I’ve had a bite before then of course. This gives the fish plenty of time to find and settle over the bait after the initial disturbance the crash of the feeder has made. Once you have a bite I feel there is no problem refeeding a full Method feeder even if the bite is quite quick as the fight and the disturbance made by the fish will have scattered most of the loosefeed anyway, so you are in essence starting again almost.